For those looking for a floor that screams pre-eminence, Swiss Hardwoods-Intense Grey-White is your floor. Its subtle mix of white and grey with a lovely brushed grain will look very effective in a setting with accented interiors. 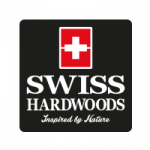 You could Consider adding a distinctive skirting to the perimeter borders from our extensive collection of Swiss Hardwood flooring accessories. Borders with matching or contrasting accessories along with the bevelled edging of this plank can lend a custom look to your floor. This semi solid wood floor offers the warmth and grace of a real wood floor and much more. Unlike solid hardwood our engineered wood from Swiss Hardwood is assembled in layers using state of the art technologies These multiple layers overlap each other at 90 degree which gives your floor that dimensional stability and rigidity making it less sensitive to climatic change and humidity.